Epigenetics has been a buzzword in biology for the past several years, as scientific understanding has grown about how genes are expressed. We now know that segments of DNA–genes–can be silenced by chemicals in DNA’s local environment; likewise, genes can be “turned on” in ways that allow populations of cells to churn out proteins at high speed, at sluggish rates, or at any speed in between. As a result, biologists’ traditional concern with which genes an individual has has been replaced in some quarters with a concern about how an individual’s genes are being used. After all, if you have a gene that’s been turned off, you’re going to look a lot like someone who doesn’t have that gene at all. The insight that there are epigenetic factors that turn genes on or off has gone a long way toward explaining why the sequencing of the human genome left us with so many unanswered questions, despite some people’s expectations in the late 1990s that the human genome project would provide us with life’s blueprints. Gene expression is such a fundamental biological process that research on epigenetics has been sprawling in scope, covering a wide variety of domains. For instance, molecular epigenetics has discovered mechanisms by which gene expression can be affected, and developmental epigenetics has investigated how the same DNA sequence can be used in different cells to produce cell-types as distinctly different as those in bones and brains. Disease epigenetics has shed light on the development of cancer as well as on less common disorders such as Prader-Willi syndrome and Rett Syndrome, and environmental epigenetics has examined how exposure to environmental toxins influences how our bodies function. But one of the most exciting research domains in recent years has been behavioral epigenetics, which studies how epigenetic factors affect behavior and how behaviors can influence epigenetics. Research in this area is drawing particular attention because of how it promises to illuminate the age-old question of how nature and nurture interact to produce our psychological characteristics. It was not long ago that it was possible to imagine that some of a person’s characteristics were inherited whereas others reflected that person’s experiences. Advances in theoretical biology and developmental science revealed this simplistic conceptualization to be a fantasy by the end of the 20th century, because it became increasingly apparent that all of our phenotypes–from biological traits like skin color and height to behavioral traits like intelligence and risk-taking–emerge from interactions between genetic and non-genetic factors. But a deeper understanding of the mechanisms underlying gene-environment interactions has emerged more recently, as molecular biologists began focusing on the epigenetic control of gene expression. This work has revealed how our experiences can affect factors inside our bodies in ways that alter the functioning of our genes, and thereby our behavior. 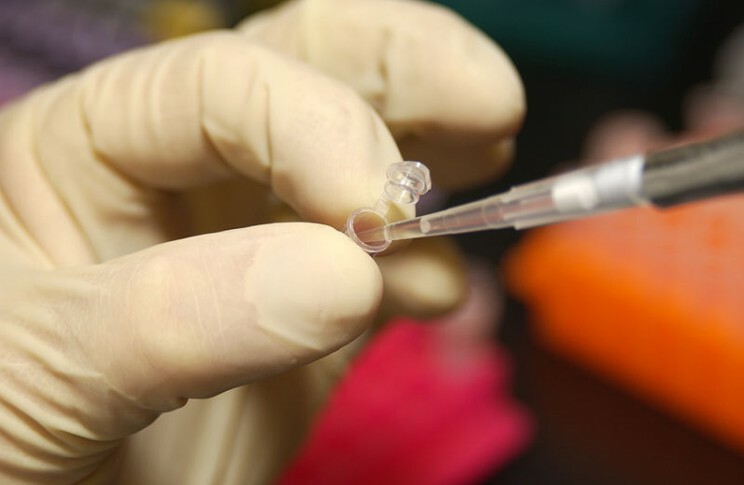 Researcher using a pipette to extract DNA from a micro test tube by Maggie Bartlett, NHGRI. Pubic Domain via Wikimedia Commons. The best-known example of this phenomenon is Michael Meaney’s and Moshe Szyf’s discovery that certain maternal behaviors exhibited by new mother rats alter the epigenetic state of genes in their newborn pups’ brains, leading the pups to develop into adults who react better to stressful situations than do offspring who experienced different maternal behaviors. Because Meaney, Szyf, and their collaborators were able to demonstrate that maternal behaviors can produce epigenetic effects that influence the speed at which pups’ brains produce glucocorticoid receptors–proteins known to play essential roles in mammalian stress responses–their work uncovered a physical mechanism by which an experience in infancy can change DNA in ways that have long-term effects on behavior. Later work with primates revealed similar effects in monkeys, and correlational data have strongly suggested that similar mechanisms are at work in us as well. To date, studies have shown how a diverse array of experiences can effectively get inside of us and alter how we behave, sometimes many decades later. Some of these effects are not particularly surprising; many of us have an intuitive sense that environmental toxins can enter our bodies and change their functioning, so in these cases, evidence that epigenetic events are involved might seem like mere elaboration of the details. But few of us would have expected to find that individuals who grew up in poverty are epigenetically different than individuals who grew up in more privileged environments, particularly when such effects are detectable in individuals who–despite their different childhood circumstances–have grown up to be middle-aged adults sharing the same socio-economic status; in these people, the effects of their early childhood experiences seem to have been archived in their epigenomes. Likewise, the discovery that researchers can cause epigenetic effects by experimentally controlling status in monkeys (by manipulating positions in a social hierarchy) was striking. Experiments with rodents indicate that normal cognitive processes can also initiate epigenetic events. For instance, when we encounter novelty in the world, we register it with structural changes in our brains, changes that require epigenetically controlled protein production. Storing information in long-term memory also appears to utilize epigenetic mechanisms. Thus, the way we think is affected by epigenetics, just as epigenetic factors affect the way we feel when we find ourselves in stress-inducing situations. Because epigenetics has been implicated in many psychological processes, mental health researchers are now looking carefully at the role of epigenetics in psychopathology. So far, studies have uncovered associations between epigenetic states and abnormal psychological conditions ranging from post-traumatic stress disorder, addiction, and depression to psychotic syndromes such as schizophrenia and bipolar disorder. Unlike a person’s DNA sequence, a person’s epigenetic state can be altered in several ways–for instance, by using drugs, diet, or exposure to “enriched” environments or novel learning contexts–and this new reality has stoked optimism that research on epigenetics will yield breakthrough treatments for a number of psychopathological conditions in the relatively near future. Feature Image: Representation of DNA by Andy Leppard. CC BY 2.0 via Flickr. David S. Moore is a professor of psychology at Pitzer College and Claremont Graduate University in southern California. He received his PhD in developmental and biological psychology from Harvard University. A developmental cognitive neuroscientist with expertise in infant cognition, Moore explores the contributions of genetic, environmental, and epigenetic factors to human development. 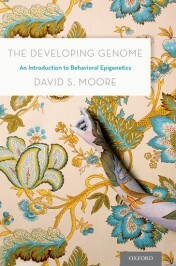 He is the author of The Developing Genome: An Introduction to Behavioral Epigenetics.